There were 639 press releases posted in the last 24 hours and 153,975 in the last 365 days. 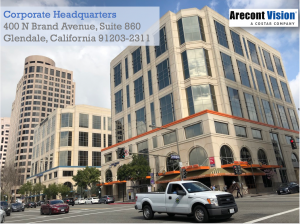 LOS ANGELES, CA, USA, March 4, 2019 /EINPresswire.com/ -- Arecont Vision Costar, the leader in network-based video surveillance solutions, announces the opening of new corporate headquarters, manufacturing, and warehousing operations, plus the creation of an Advanced Technology Center (ATC). Arecont Vision Costar launched in July of 2018 as a business unit of Coppell, Texas-based Costar Technologies, Inc. (OTC Markets Group: CSTI). The company took over the original Arecont Vision LLC’s Los Angeles County facilities in Glendale, California without interruption. Through consolidation of multiple functions with the Costar group of companies, Arecont Vision Costar has been able to invest in the hiring of new team members, engage additional sales partners, and upgrade both facilities and systems. The company’s corporate headquarters has moved to newly opened offices at 400 N Brand Boulevard in downtown Glendale, California, less than a mile from the company’s previous location. The modern new offices house Arecont Vision Costar’s executive team plus Engineering, Product Development, Inside Sales, Sales Operations, Marketing, Customer Support, Corporate Briefing Center, technology labs, and internal support functions. 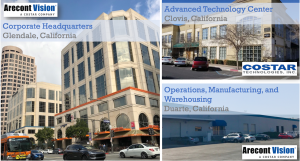 Arecont Vision Costar has also opened an Advanced Technology Center in Costar Technologies, Inc.’s new Clovis, California office, in the state’s Central Valley region. The facility features additional engineering, sales, support, and executive office space. Operations, manufacturing, shipping/receiving, and warehousing have all relocated from the previous Glendale location to Duarte, California, approximately 19 miles inland in Los Angeles County. The new facilities are close to major transportation infrastructure, including light rail and two nearby interstate highways, and are between 26 to 40 miles from four major airports and the Port of Los Angeles. While avoiding much of the traffic of Greater Los Angeles, the location allows continued rapid shipment of Arecont Vision Costar products to customers and authorized distributors across the United States and around the world. Visit Arecont Vision Costar online at www.arecontvision.com to learn more about the company or find sales contacts at https://www.arecontvision.com/where-to-buy.php.